Few musicians have had such a major influence on church music around the world in the last half of the 20th century than Andraé Crouch (1942-2015). It would be difficult to overestimate his importance in the Gospel music field during the last 50 years. Few have had such a sustained level of accomplishment and recognition in gospel music—seven Grammys, six Dove awards, an Oscar nomination, induction into the Gospel Music Hall of Fame (1998), a star on the Hollywood Walk of Fame in 2004, and much more. 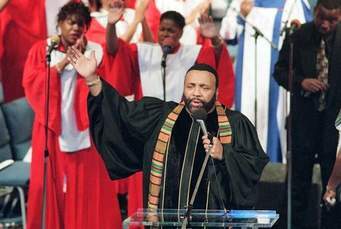 Andraé Crouch’s career also extended beyond the gospel song field. He received an Academy Award nomination for his compositions and arrangements for the film The Color Purple (1985). He was the arranger and choral conductor for The Lion King (1994). He worked with artists such as Diana Ross and Ringo Starr and collaborated with many artists on recordings. Some of the most famous names in the business recorded his songs including Bob Dylan, Michael Jackson, Elvis Presley, Paul Simon, and Madonna. Andraé and his twin sister Sandra were born in San Francisco. Their parents owned and operated dry-cleaning and restaurant businesses. In addition, they were heavily involved in ministries including street-preaching, hospital, and prison work. Whenever his father was asked to preach in small congregations, Andraé could be found at the piano playing and singing. He wrote his first Gospel song at age 14. Following an extensive composing and performing career that took him to the farthest reaches of the planet, the Crouch twins shared the ministry as senior pastors of the congregation their parents founded upon their death in 1993, Christ Memorial Church of Christ (Pacoima, California). “Bless the Lord” (1973) was included in his album Just Andraé, which appeared that same year. This was the era of the scripture song in the evolving Contemporary Christian Music movement. (Lim and Ruth, 60-68) The refrain of this song is a direct quotation from Psalm 103:1 (KJV). The bridge, consisting of the five words “He has done great things,” summarizes the blessings of God enumerated in the remaining 21 verses of the Psalm. It is designed so that the singer can easily commit it to memory and sing as long as the Spirit moves. “Bless the Lord” became a staple of Crouch’s repertoire from 1973 on and was sung as the opening song at his funeral as his casket was brought into the church (youtube.com/watch?v=CmYIozddKCg). They stared at me like I was crazy and a loud murmur went through the white congregation! Then I said, ‘No, no, I’m just kiddin’ you,’ and everybody was laughin’. . . I try to use humor to ease different situations but I want people to know I’m out there for Jesus and I love everybody. . .
Andraé Crouch, with Nina Ball, Through It All (Waco: Word Books, 1974). Swee Hong Lim and Lester Ruth, Lovin’ On Jesus: A Concise History of Contemporary Worship (Nashville: Abingdon Press, 2017). Carlton R. Young and J. Richard Watson, “Andraé Crouch.” The Canterbury Dictionary of Hymnology. Canterbury Press, accessed August 28, 2018, http://www.hymnology.co.uk/a/andraé-crouch.